Oversupply in the LNG market is having a knock on impact on the LNG carrier market. 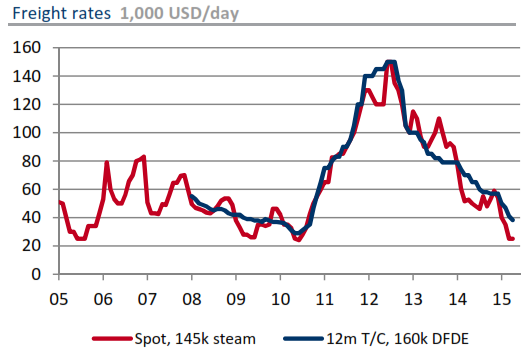 LNG vessel charter rates have suffered another down leg in 2015, with spot charter rates falling to USD 25,000 per day. Rates have halved in the last six months, falling back to levels seen in the depths of the global financial crisis. The breakeven cost for delivering new vessels is estimated to be around USD 60-70,000 per day. Term charter rates (12mths+) have now fallen below USD 40,000 per day, opening up a sizeable gap versus new build recovery. 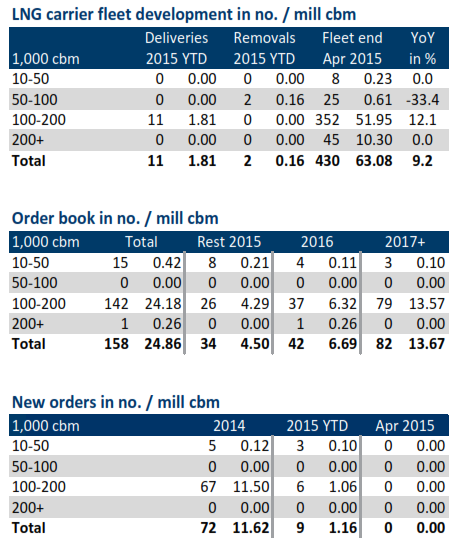 But despite these numbers, there is still a substantial volume of LNG vessel capacity under construction. New capacity and changing route dynamics are likely to ensure downward pressure on charter rates remains over the next two or three years. Chart 1 illustrates the interesting journey of LNG vessel charter rates over the last five years. A post financial crisis shortage of vessel capacity combined with longer post-Fukushima vessel journeys (Asian diversion), caused a sharp squeeze in charter rates from 2010-12. A reverse in these factors has driven the fall in charter rates from their peak above USD 140,000 in mid-2012. The decline in charter rates over the last 12 months has been particularly impacted by changing LNG flow dynamics. Convergence in Asian & European prices since summer 2014 has undermined demand for vessels to facilitate high volume diversion of LNG from Europe to Asia. As a result the number of longer distance voyages and therefore vessel utilisation has fallen substantially. In addition the smaller returns from LNG spot trading and portfolio optimisation have created a greater focus on the costs of diversion economics. Squeezing out an extra 0.05 $/mmbtu in shipping cost reductions is more important in a world of 0.5 $/mmbtu diversion margin than in one where 5 $/mmbtu is possible. The number of new LNG vessel orders has almost dried up this year, an understandable reaction to plunging charter rates. However there are currently 150+ vessels on order (constituting a ~35% increase in the current global fleet of 430) as illustrated in Table 1. The vessels currently on order reflect long delivery lead times. These orders were committed on the basis of the wave of new liquefaction capacity currently under construction (as we set out here). Orders were also supported by the assumption that the majority of flexible and spot LNG supply would continue to be diverted to Asia, supporting vessel utilisation. The rapid convergence in global spot prices is a key factor weighing on charter rates in 2015. The LNG carrier market is set to undergo a rapid phase of evolution with more than 150+ bcma of new liquefaction capacity to be commissioned by the end of this decade. New liquefaction capacity creates a requirement for shipping capacity. But much of the new liquefaction capacity is located in Oceania, under long term contracts to Asian buyers. Vessel orders to support these contracts were made on the basis of a tighter carrier market and substantially higher charter rates. New vessels and anaemic charter rates present a threat to older vessels in the existing fleet. Scrapping or mothballing vessels has not been a strong feature of the LNG market to date, although two vessels have been removed from the fleet in 2015. A continuation of lower charter rates may start to take its toll on older vessels that are more expensive to operate. Perhaps the most important uncertainty going forward is the evolution of LNG flow dynamics. A recovery in the Asian LNG price premium (over Europe and the US) will support higher vessel utilisation and in turn support charter rates. But if, as we suspect, the current period of global LNG price convergence continues towards the end of this decade, downward pressure on charter rates is likely to remain.